1. Click the My Account tab at the top of the screen, then click the Options sub tab at right. The screen below will appear. After you have made the desired selections on the screen below, be sure to click the green Update button at the bottom of the screen to save your changes. 2. Set your Main Navigation Menus. You can customize the navigation bars to display at either the top of your screen, the bottom of your screen, or both. For a detailed explanation on the use of these bars, click here. Following is a view of the Bottom Navigation Menu. If you set a navigation bar at the bottom of the screen, a pop-up will appear when you mouse over one of the menu tabs. In the sample below, the mouse is pointing to the Home tab, causing the Home sub-tab options to display in a pop-up. The Top Navigation Menu is shown below. This menu works in conjunction with the Side Navigation Bar discussed in step #3. 3. If you elect to view the Bottom Navigation Menu only, you may want to hide the Side Navigation bar (shown at left). To remove it, click the Hide Side Navigation checkbox. By selecting this option you provide more space for the larger screens within Broker Brain. Note: If you choose to hide the side Navigation bar, be sure you have your Bottom Navigation bar available. When you roll your mouse over the bottom navigation bar, all of the Side Navigation options will appear in a pop-up. 4. If you elect to display the Side Navigation bar, you can also elect to have it move with the screen each time you scroll down. This keeps the sub tabs visible at all times. To enable this feature, click the Scroll Side Navigation checkbox. Note: If you choose to have the Property Header at the top of your screen, it will disappear as you scroll through the screen. If you choose the bottom option, it will always be visible. box. Showing only the subject and sender simplifies the process of locating information when multiple notes exist. 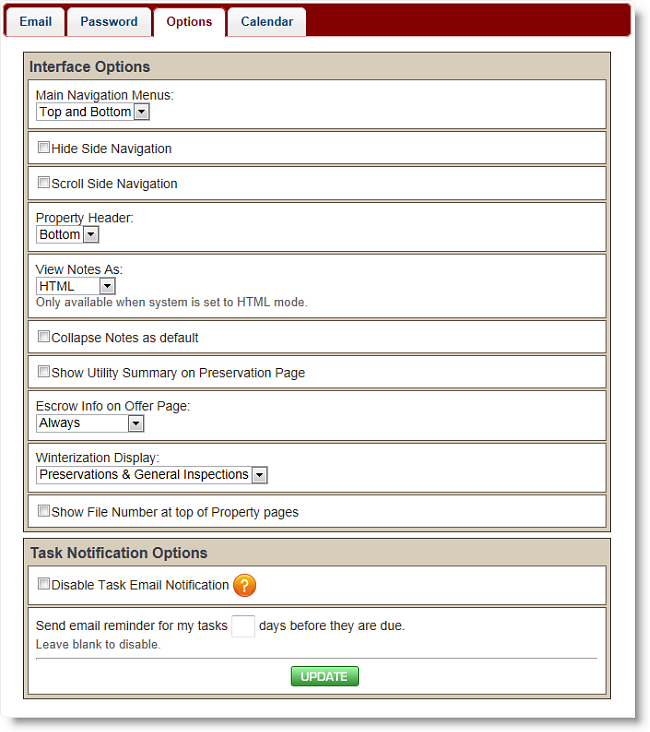 Show Utility Summary on Preservation Page will generate a summary of a property’s utility information on the Preservation Tab. 9. Using the Escrow Info on Offer Page drop-down, you can control when/if the Escrow box is visible on the top of the Offers tab. Select either Always, Accepted Offer, or Never. 10. In the Winterization Display field, indicate whether you want the Winterization field to appear under Preservations, General Inspections, or both. Broker Brain will display this number in the Properties section. Disable Task Email Notification - Check this box and click Update to disable email notifications to you when a group you are in receives an Auto Task. Note: If you have chosen this option and are still receiving emails, it is likely that there are other users in your office that have your email address for their Broker Brain account. Send email reminder for my tasks ___ days before they are due - This will set the system to remind you by email when upcoming tasks are due. You determine how many days prior you wish to be reminded by entering a number in the space provided and clicking Update. You will only be reminded of due dates for tasks you own.